The amazing Johnny Cash tribute band Cold Hard Cash will be performing on Friday, February 15 at the Elks Club; one show at 7:00 pm and one at 9:00 pm. AND…the concert is open to people under the age of 21 — the bar section is sectioned off from where the band is performing. I know that there are lots of older teens and young adults who love Johnny Cash, so now they get a chance to see Cold Hard Cash in action! 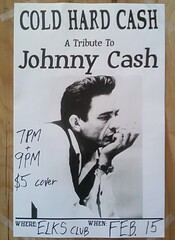 If you know someone who loves Johnny Cash, tell ’em to catch this performance (or e-mail this entry to them)! UPDATE: we stopped by the Elks Club for a while and enjoyed the band – they really are awesome.